Such designs tend to be unwieldy in confined spaces, and unsuitable for many industrial production line processes. As a result, delta arms – a series of interconnected parallelograms which restrict movement to the X, Y or Z directions and do not rotate – have become popular for use in tight workspaces. But, when faced with a requirement for both flexibility and compactness, a design that incorporates the best of both types is required. That’s where the double-delta robot comes in. The standard delta robot was invented in the early 1980s by Reymond Clavel. When Aad van der Geest, an independent developer of software and electromechanical products, became acquainted with the delta robot for the first time, he was enamored with the design. 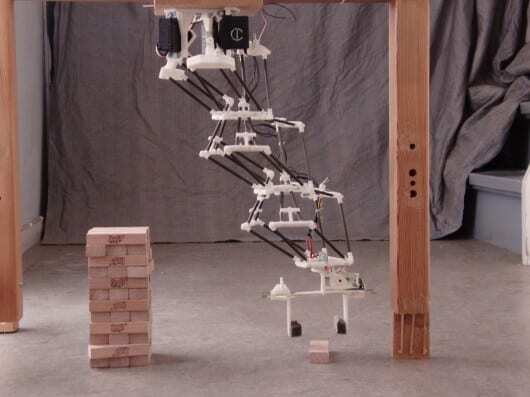 However, when he attempted to use it in a practical situation, he was instantly aware of its one big problem: the robot is only capable of movement within a very small volume of space. Traditional robot arms such as those used in heavy industry have large amounts of inertia to overcome and require correspondingly weighty components, but they are also strong and flexible. Van der Geest wanted to find a way to improve on the original lightweight delta creation with the parallel linkages to make it more useful in applications requiring traditional robot arms, but without their weight and inertia. His idea, like many innovative ideas, was simple: Link multiple delta arms together, but leave the heavy control mechanisms and actuators attached to the base. September 17, 2018 - Robots could create double the jobs they displace by 2022 Manufacturer.comLatest research forecasts that by 2022, robots and AI could create over 130 million jobs, this almost double the figure they are set to displace. June 7, 2018 - Construction Robotics Industry Set to Double by 2023 ENGINEERING.comAccording to a recent market report, the construction robotics market will double in the next five years. But where exactly will the growth be? January 19, 2018 - millidelta robot is the smallest, fastest and most precise of its kind Designboomthe millidelta might win the category of smallest robot but its pretty mighty and quick, so much so it's just a blur on camera.